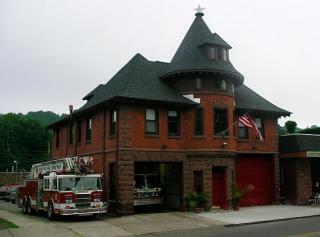 This fire station was originally built for the Cliffside Hose Company #4 in 1901 The hose company itself organized in 1888. The building is listed on the state and national registers of historic places. It was designed in the Queen Anne style by Effingham R. North, the same architect who developed the Erwin Park section of Montclair as well as several residences. His design style is evident in the building with the double-hipped roofs and the use of a cupola.